Library Loot is a weekly event co-hosted by Eva and myself that encourages bloggers to share the books they’ve checked out from the library. If you’d like to participate, just write up your post-feel free to steal the button-and link it using the Mr. Linky any time during the week. And of course check out what other participants are getting from their libraries! I have been a bit remiss this week. I haven't been to the library at all. Not to return my overdue book, or to pick up the ones that are waiting for me. I was intending to go tonight, but my son had an adverse reaction to having to do football training in the rain and hail tonight, so I had to go and take care of him instead. I managed to get soaked in the rain as well, so once I got home I was in no mood to go out again. Not sure if I will get there before Sunday to be honest, but if I don't then my holds are going to expire! Before I put up the Mr Linky, I thought I would mention a new blog feature called Library Love which has been started by Mollie from Book Fare Delights. She is looking for stories about your experiences and opinions about libraries, particularly due to the struggle for funding that many public libraries are experiencing at the moment. 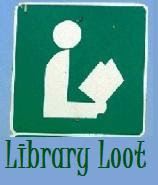 Molly has also created an alternative badge for Library Loot which is gorgeous! She is happy for other people to use the image, but please respect her request that credit be given to her if you do use it. 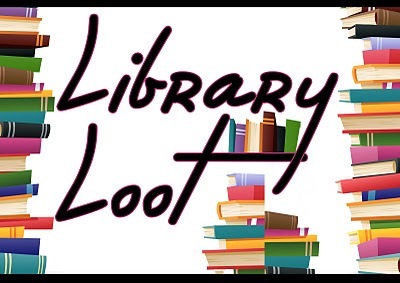 Hopefully you have all managed to get to the library and therefore have loot to share! If you do, add your link to Mr Linky below so that we can all come around and check out your loot. Hope you get to your books soon, Just one for me this week. Thanks for linking to my Library Love post. Appreciate it! Working on my "Loot" post! Just one book from the library for me again this week. I also love to haunt charity shops looking for a bargain to buy.. So, I will be reading 'Mr Golightly's Holiday' (salley vickars) and 'Breathing Lessons' by Anne Tyler [another of my fave authors] and both bought very cheaply! what a pretty badge, i love the colors and will def use it next time! and i post library stories all the time (in fact one of my most used category tags on my blog is Library Love!) so ill be sure to link up. happy reading all! Some of my recent Library Loot! hope you got to pick up your library books! I had to send all of mine back last weekend as I left town but now have some out on my sister's card to see through my six week stay at my Mom's. Some people are so talented!